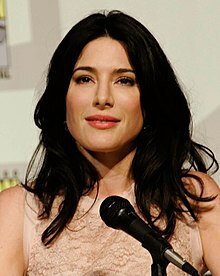 جیمی موری (اینگیلیسجه: Jaime Murray) بریتانیالی اوْیونچو ۲۱ ژولای ۱۹۷۶ ‏ میلادی تاریخینده لندن شهرینده دۆنیایا گؤز آچیب. ۲۰۰۱–گۆنوموز ایللر آراسیندا سینما ساحه‌سینده چالیشیب. 2001 The Bill Tania Matthews Episode: "A Pound of Flesh"
2002 Casualty Sonia Guzman Episode: "Thicker Than Water"
2003 Keen Eddie Kiki Episode: "Pilot (a.k.a. Eddie)"
2004 Doctors and Nurses Bella Olazabal Episode: "Bella Bella"
2005 Love Soup Natalie Brown Episode: "Death and Nurses"
2005 ShakespeaRe-Told Bianca Minola Episode: "The Taming of The Shrew"
2005 Agatha Christie's Poirot Ruth Kettering Episode: "The Mystery of the Blue Train"
2009 The Mentalist Nadia Sobell Episode: "Carnelian Inc."
2009 Eli Stone Diane Rundlet Episode: "Flight Path"
2009 NCIS ICE Agent Julia Foster-Yates Episode: "Semper Fidelis"
2012 Finder, TheThe Finder Amadea Denaris Episode: "An Orphan Walks Into a Bar"
2012 Childrens Hospital Kitty Black Episode: "British Hospital"
2015 Sleepy Hollow Carmilla Pines Episode: "Kali Yuga"
2010 Suite 7 Jessy Episode: "Good in Bed"
اینگیلیسجه ویکی‌پدیاسی‌نین ایشلدنلری طرفیندن یارانمیش«Jaime Murray»، مقاله‌سیندن گؤتورولوبدور. ( ۲۱ دسامبر ۲۰۱۷ تاریخینده یوْخلانیلیبدیر). قارداش پروژه‌لرده جیمی موری گؤره داها آرتیق بیلگی‌لر تاپابیلرسینیز.